My lamb came from the Oriental Trading Co. in the early 90s. She had little pink feet, pink inside her ears, and red stitching for her nose and mouth and was also quite small, the right size to fit into a pocket. She was a very simply made little lamb plush. I had this lamb when I was very little, but I loved her. 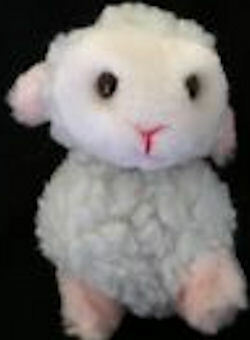 I think I may have called her ”Lambie.” I’ve looked for her on Ebay and other places online, with no luck. If you could help me search for her, I would really appreciate it! Please add the POST CODE to your comment.